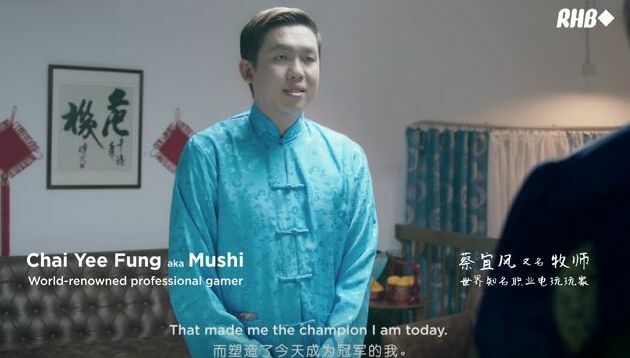 To celebrate the value of determination and courage to challenge society’s conventions, RHB Group’s latest video in its “Challenger Series” features renowned professional gamer Chai Yee Fung, also known as Mushi. Titled “Belief”, the video was done in collaboration with FCB Kuala Lumpur and inspired by Mushi’s bold decision to pursue gaming as opposed to the more traditional career paths. Training relentlessly and with the constant support of his parents, Mushi became one of the world’s most celebrated pro gamers, and he played an integral role in putting Malaysia on the map with the gaming community, as the country embarks on its quest to be a hub for e-sports. The video runs on RHB’s social media channels and garnered 118k views, 1.3k reactions, 154 comments and 971 shares on Facebook at the time of writing. RHB’s group CMO Abdul Sani Abdul Murad said the bank is a champion for all and it wanted to show that progress can come in many forms. He added that Mushi embodies the RHB spirit and what it believes in, which is “Together We Progress”. “His courage to challenge society’s conventions and his parents’ belief in their son’s own nascent ability has made Mushi’s dream a reality,” he said. Meanwhile, FCB’s chief creative officer Ong Shi Ping expressed excitement over the opportunity to create daring storylines with such unlikely partnerships. “Who would have thought that a bank would be so supportive about the life story of a gamer? ‘Belief’ shatters traditional conventions of banks playing on safe corporate-like narratives to pander to the usual festive sentiments. We’re extremely honoured to work on a brand that is brave enough to support ordinary Malaysians who have made their goals a reality, no matter how unconventional their dreams may be.” he said. The incident occurred while the stock market was on its lunchtime break at around noon. .. The incident was first brought to light when a video was made available online of the passenger accusing the driver of “cheating” ..